You just got your brand new TRAMS TRINAMIC Arduino Mega RepRap Shield? Install the Arduino IDE and the Arduino USB driver as shown in the official Arduino guide. Connect the Arduino Mega without the TRAMS with the computer. Open the “Marlin.ino” from the firmware folder with the Arduino IDE. Select the Arduino Mega board and the correct USB port in the IDE and upload the firmware. To test if the firmware was uploaded properly start Repetier-Host and press Strg+p. Now choose your USB port and set the baud rate to 56000. This is what you should see when sucessfully connected. Unplug the Arduino from the USB port. It should not be connected to anything right now. Then plug the TRAMS on the Arduino. 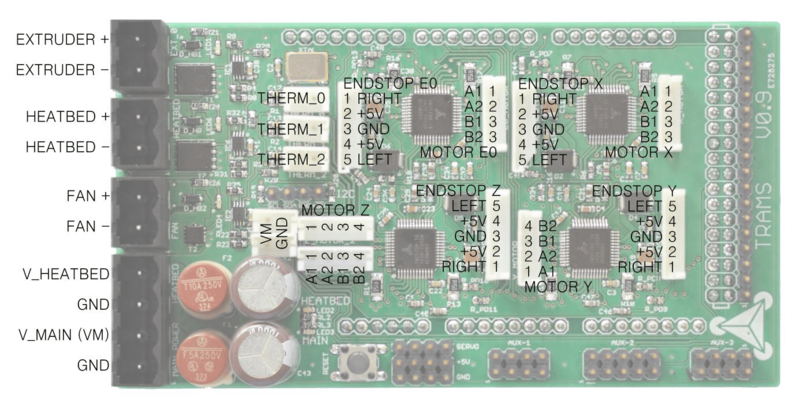 Make sure that the main power (VM) and the heat bed power (V_HEATBEAD) are NOT connected to a power supply! You can damage the board if you connect/disconnect parts (e.g. 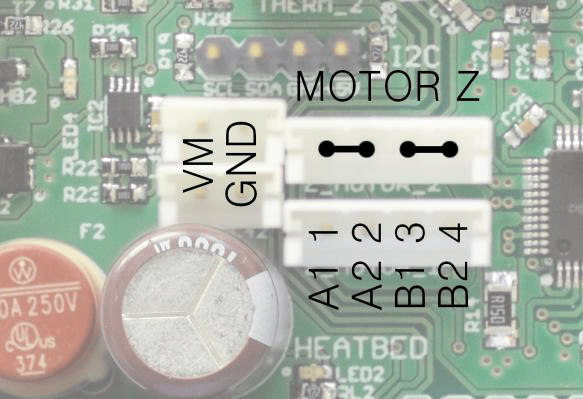 motors) while under power. Connect the motors to the corresponding connector. pin 3 to 4 at one of the connectors. Connect the end stops for the X-, Y- and Z-Axis. The Extruder normally doesn’t need an end stop. IMPORTANT: Right now, the firmware only supports using one end stop per axis which needs to be the left one. 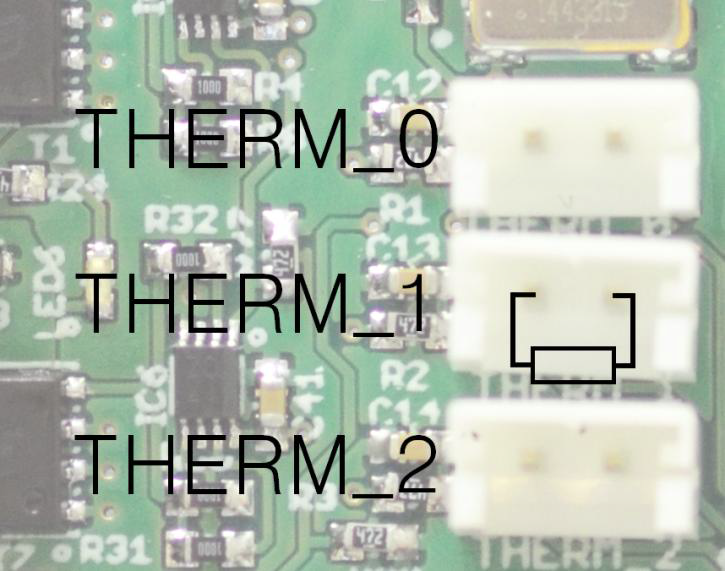 Connect the extruder thermistor to THERM_0 and the heatbed thermistor to THERM_1. (We used 100k thermistors for testing). If you don’t use a heatbed you still need to connect a 110k “dummy” resistor to the THERM_1 port. Connect the extruder heating cartridge to the EXT_0 connector. If you have a controlled fan for cooling the printed filament you can connect it to the FAN connector. Watch out for the right polarity. If you have a fan or lights which needs to be powered all the time you can connect them to the two VM ports. If you have a heatbed connect it to the HEATBED port. Make sure that both fuses are working properly. If you have a heatbed you need to connect V_HEATBED to 12-24V, as well. Connect the Arduino with the computer. Start Repetier-Host and click on “Connect”. If your printer starts the homing as expected, you are ready to print now. When will the board be for sale? We just received the preseries and started series production. In a few weeks it will be available. Hi Himanshu, sorry for the long silent period. It took some time to get them ready for manufacturing, but now they are ready. Digi-Key already lists them and other distributors will follow soon. I hope they will be available for shipment by beginning of December. The Boards will be avaliable from beginning of december via distribution. any news on the availability of the boards? Only DigiKey lists them at a unit price of 83.64 $ but not in stock. we shipped on Monday. Hope they are on stock today. Hi If i supply Trams with 24v is Arduino 2560 overvoltage or not? is stallGuard function enabled on TRAMS with modified Marlin firmware ? Hi Alessio, it is not supported in the sample-software right now, but it is possible to implement.